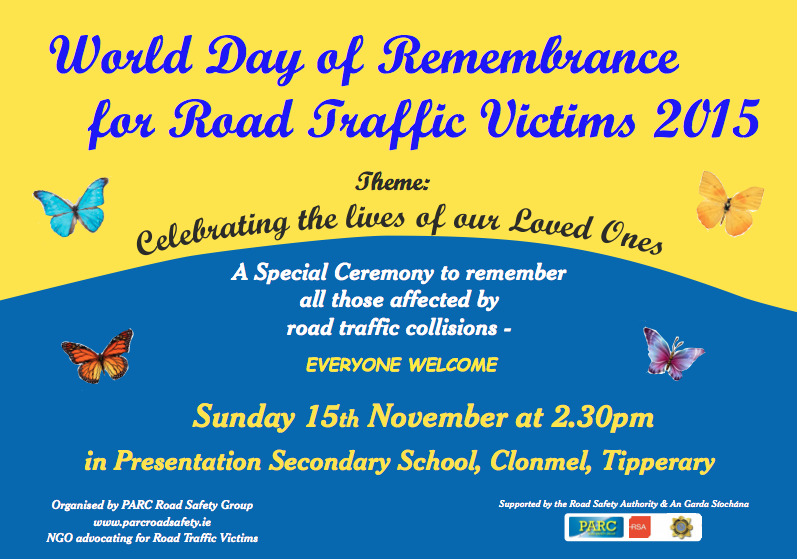 The World Day of Remembrance for Road Traffic Victims (WDR) is on the third Sunday of November every year. This day was initiated by road traffic victims in 1993 and is dedicated to remembering all those killed and injured on the roads and all those affected by their death or serious injury. We feel that this remembrance day is a very fitting tribute to all our lost loved ones, to have a day each year set aside in memory of their life on this earth. It is also a day that we must remember all those who have been seriously injured in crashes, many who are left disabled for the rest of their life. 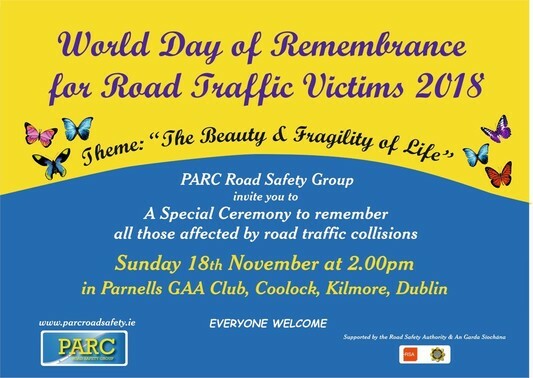 PARC is holding a special ceremony on Sunday 18th to remember all those who have died in road traffic collisions and those left with serious injuries. On Sunday 15 November 2015 PARC will be holding their 7th annual remembrance event to mark WDR in the Presentation Secondary School, Clonmel, Tipperary at 2.30pm. Everyone welcome. 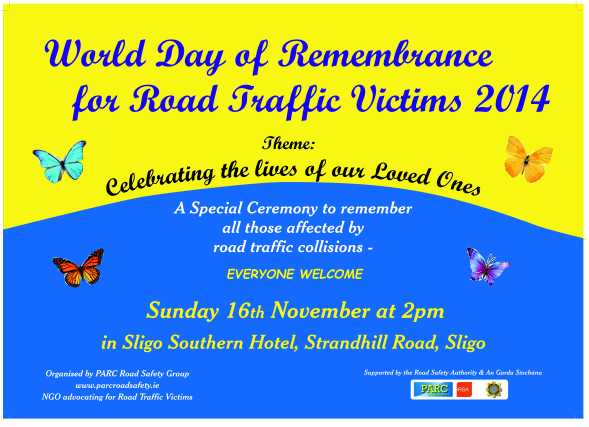 On Sunday 16th November 2014 PARC Road Safety Group held their 6th annual remembrance event to mark World Day of Remembrance for road traffic victims in the Sligo Southern Hotel. 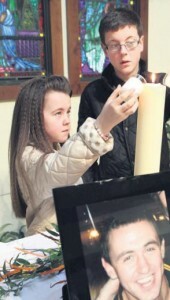 This special event was held for road traffic victims and their families & friends. Sergeant Sheila Tuohy & Garda Brendan Gardiner from Sligo Garda Station read the name and age of every person killed on our roads in the past year and a butterfly was placed on a tree in memory of each one. 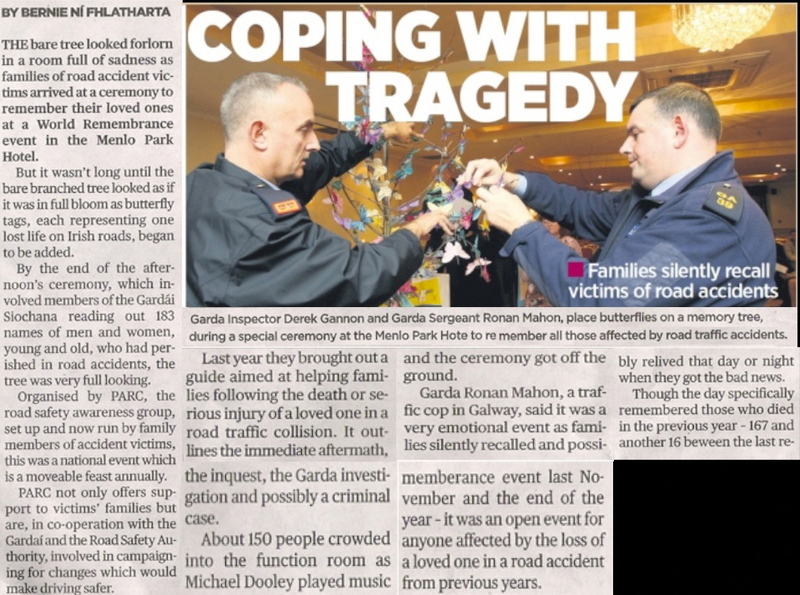 To see the tree full of butterflies was a stark reminder of how dangerous our roads are and an obvious sign that road safety messages are not being heard & the statics echo this because in ﻿2013 alone 163﻿ were killed on our roads and so far this year 170 families, friends and communities have lost a loved one. Bernard Mulhern of the N4 Action Committee spoke about the work the committee have done to try and make safe the 11km stretch between Calstlebaldwin and Cloonamahon which is lined with 30 crosses indicating the deaths from road traffic collisions on this road. Members of the Sligo City Firefighters and Stanley Morrison an ambulance crew member of Sligo Regional Hospital were also in attendance and were thanked by all those who attended for the difficult job they do and for the service they provide. 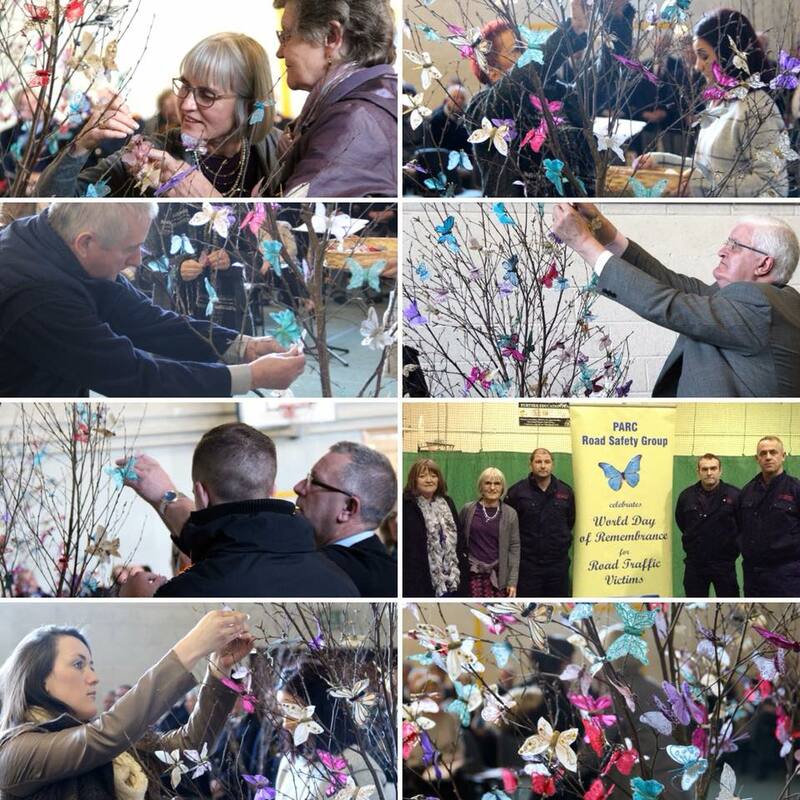 The bereaved family members who attended were given the opportunity to join in the service to celebrate the lives of their own loved ones, they placed a butterfly on a tree to remember the loved one they lost. Susan Gray Founder of PARC spoke about the endless work of PARC and the services they provide to families who have lost a loved one. 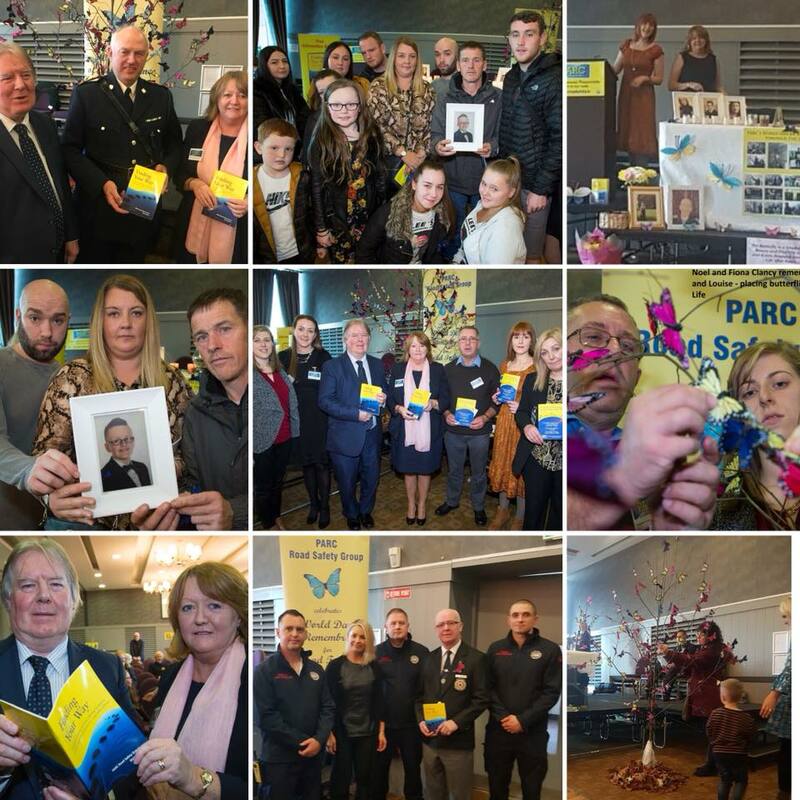 Free copies of the 2014 edition of PARC's guide for families of victims called Finding your Way were available to all those attended in the hope that it would offer guidance to all those affected by road traffic collisions. The ceremony ended with a song from Westlife called I’ll see you again, a very poignant end to a deeply moving ceremony. 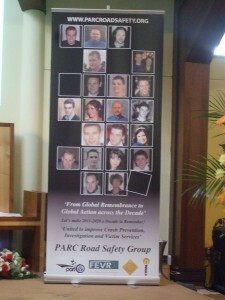 On Sunday 17th November PARC Road Safety Group held their 5th Annual Remembrance Day event to mark the World Day of Remembrance for Road Traffic Victims. In order to encompass all in our country who have lost loved ones or who live with serious injury through road traffic collisions we travel to a different county each year. 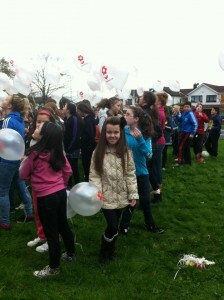 This year the venue was the Menlo Park Hotel, Headford Road, Galway. Members of An Garda Siochana assisted PARC in preparing for this event along with the emergency services and members of the public. 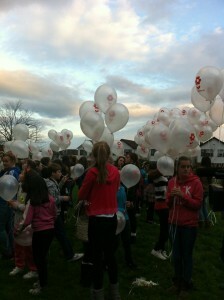 Bereaved families took part in the ceremony where the theme was 'Celebrating the lives of our loved ones'. For World Day of Remembrance 2012 PARC launched a guide for families of victims titled 'Finding Your Way' following the death or serious injury of a loved one in a road traffic collision. 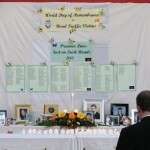 On Sunday 20 November 2011, PARC Road Safety Group held a ceremony in Castleknock to mark the World Day of Remembrance for Road Traffic Victims. If you weren't able to attend the Ceremony, we offered to light a candle in remembrance of your lost loved ones on your behalf. We could also add your message to our Book of Remembrance which is available to view here on our website. 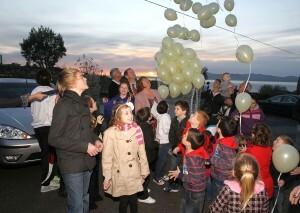 Balloons of remembrance were also released on the day in memory of all of those who have sadly lost their lives on our roads. PARC do not charge any fee for doing this on your behalf. Prayers for Road Victims were also included in Remembrance services in the various Parishes nationwide and many of the Road Safety Officers around the country were also publicising their own Remembrance activities in their locality. Thank you for supporting. People came to the special service from throughout the county and further afield to pay personal tributes to their lost loved ones. 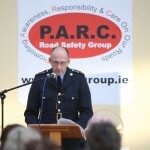 Mr. Noel Brett CEO of the Road Safety Authority opened the ceremony for PARC Road Safety Group while members of the Gardai, emergency services and clergy took part. Monsignor Eamonn Martin (representing the Bishop of Derry), Fr. 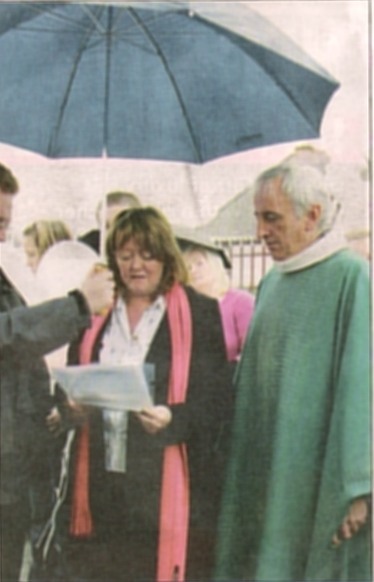 Seamus Gallagher (representing the Bishop of Raphoe), Rev. Sam Barton and Rev. Stanley Stewart lead the prayers during the inter- denominational service.The beautiful music was supplied by Hugh P. Doherty and his daughter Maria from Buncrana. Families took the opportunity of signing a Book Of Remembrance as they entered and left a message to their precious lost loved ones. 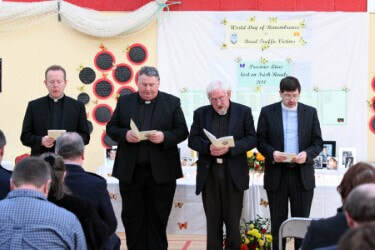 During the service the names of the 198 people who have died on our roads this year in Ireland was read out by a member of the Garda Síochána, including the eight people killed in Inishowen, in the country’s worst ever car crash on 11 July 2010. A candle in memory of all who died on the world’s roads (placed among the photographs of those killed) was lit, a candle in memory of those killed on Irish roads and a third candle was lit in memory of those who died on Northern Ireland’s roads. The service was brought to a close by the playing of “Aidan’s Exam Tips” by Michael Leonard and his son Brendan from Leitirm, composed by Brendan in memory of his brother Aidan who was killed on New Year’s Day in 2005. 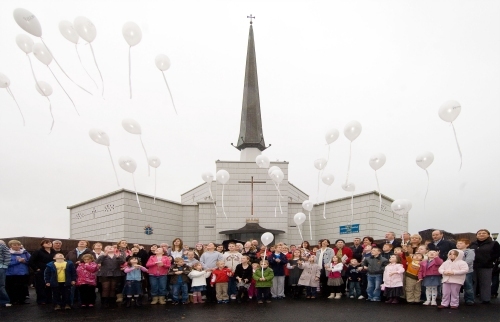 Photo: Children release 32 balloons at a special ceremony at Knock, Co. Mayo, as a mark of respect to those who have died in road crashes in 32 counties across Ireland. Thousands turned up for the special ceremony at Knock Shrine, Co. Mayo on Sunday 16th November for World Day of Remembrance for Road Traffic Victims. 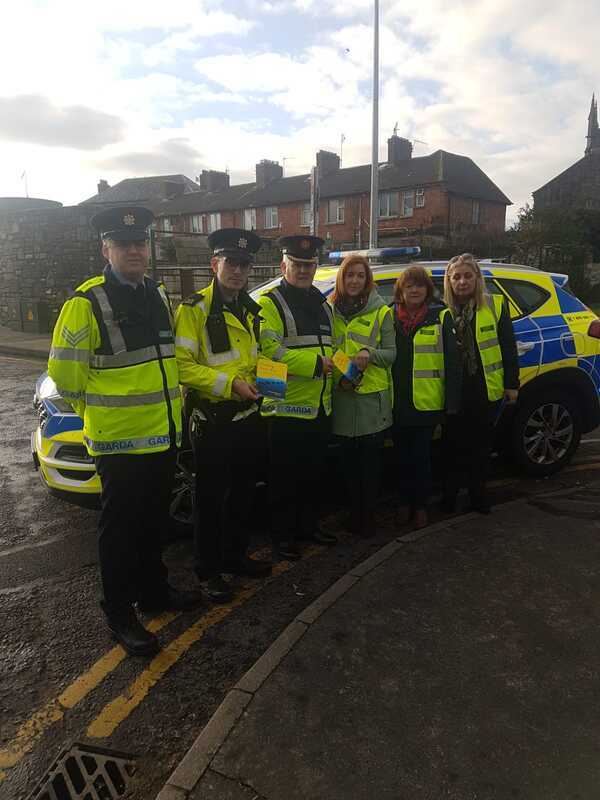 The ceremony, which was supported by the Road Safety Authority (RSA), Mayo County Council, PARC Road Safety Group, Gardai and the Emergency services was organised by Mayo Road Safety officer, Noel Gibbons. Fr. Richard Gibbons gave a very moving and heartfelt sermon. Sean Costello was the guest singer at the ceremony and brought many to tears with his beautiful and very appropriate songs. 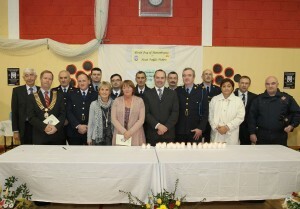 Michael Rowland, RSA, Susan Gray, PARC and members of the emergency services read at the service. Prayer cards for protection on our roads were distributed to the many thousands who attended Knock. 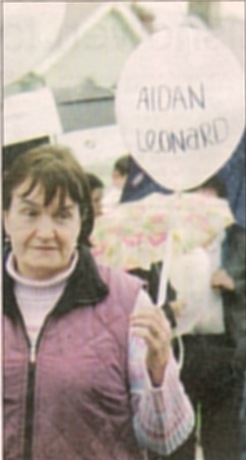 Afterwards a special prayer was read by Teresa Leonard PARC Leitrim, while 32 children released balloons in memory of all those we have been lost on our roads in the 32 counties. Everyone was moved by the beautiful ceremony and we thank the organisers for commemorating the dead and acknowledging the pain of their families. 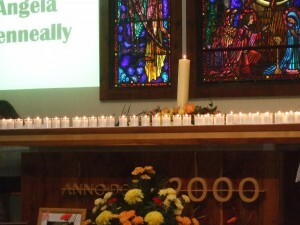 A special service was also organised by Michael O Neill, PARC, Drogheda, Co. Louth, where thousands of stones bearing the names of collision victims were placed around candles at the alter. 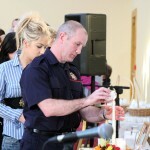 Services were also held in Co. Carlow. It was a day that responded to the great need for public recognition of road crash victims, which is readily given to victims of other types of disasters. It also acknowledged the work done by all those involved in the aftermath of a crash: Gardai, fire services, ambulance personnel, doctors, nurses and counsellors. Many thanks to Skellys Taxi Hire, Moville, Seamus Mc Laughlin, Minibus Hire, Greencastle and Mc Grory's of Culdaff Co.Donegal for supporting PARC on World Day of Remembrance for Road Traffic Victims. St Marys Oratory, Buncrana, Co.Donegal. 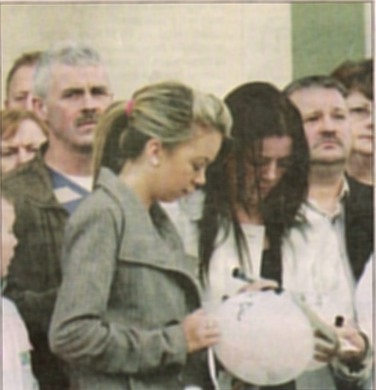 On Sunday 18th November 2007 the first ever Remembrance Day for Road Traffic Victims to be held in Ireland took place in Buncrana, Inishowen, Co. Donegal. 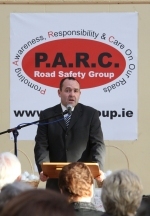 PARC road safety group organised the ceremony held in St Mary's Oratory to mark the World Day of Remembrance for Road Traffic Victims. 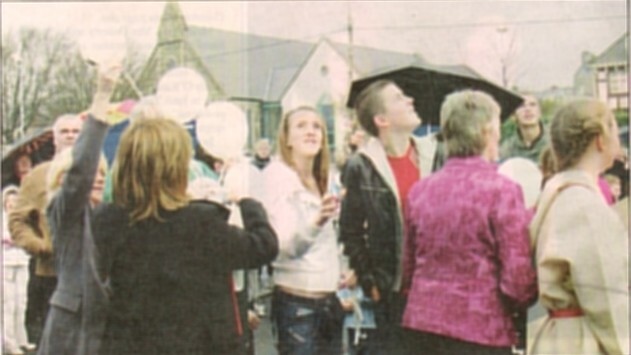 Over 400 attended the ceremony which ended with families releasing white balloons into the air, many with a name of a road traffic victim and others with a message of love. Pictured are family members of loved ones who lost their lives in road accidents at the World Day of Remembrance for road crash victims memorial service at St Mary's Oratory, Buncrana. 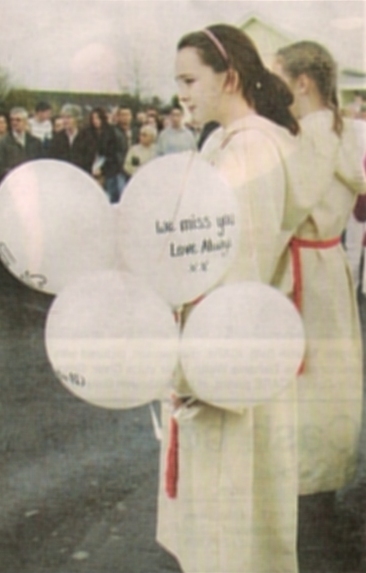 Stephanie Fullerton and Susan Gray of PARC releasing white balloons in memory of loved ones at the Wold Day of Remembrance for road crash victims memorial service at St Mary's Oratory, Buncrana. Mrs Susan Gray, national chairperson of PARC, reading a short prayer at the World Day of Remembrance for road crash victims memorial service after the special mass at St Mary's Oratory Buncrans. Included is priest Fr Con McLaughlin. and David Steele in a car accident at the Cross, Quigley's Point in 2005. 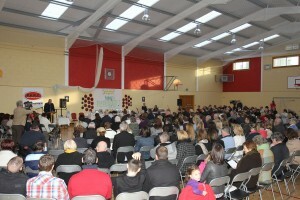 Mrs Leonard pictured a the Wold Day of Remembrance for road crash victims memorial service.